A participant plays a drum during a workshop for teachers to learn how to integrate music into math, literacy, social studies, and science. Barling Elementary School teachers are looking forward to putting into practice techniques they learned about integrating the arts when school starts again. Barling is a recent addition to the U of A A+ Schools program. Carl Hill, Barling principal, said he knew other schools in the Fort Smith School District were involved with the program and that Barling students are pretty creative. After Melanie Landrum, A+ executive director, visited Barling to talk to a group of 11 teachers, Hill took the group to visit other A+ schools in central Arkansas, a five-hour round trip. “We decided it was a good match for us,” Hill said. Some of the paraprofessionals and secretaries also took the A+ training, he said. The College of Education and Health Professions at the U of A received funding earlier this year from the Windgate Foundation in Siloam Springs to support the A+ program, which is based in North Little Rock. A+ Schools provides professional development, networking, and research data to its member schools. Its focus is arts integration, in which some type of art – including music, visual art, drama, and dance – is incorporated into subjects such as literacy, math, science, and history. The Arkansas Department of Education funded five-day training sessions for new schools this year. At least 85 percent of a school’s teachers must approve of a school’s application to A+. Once a school is accepted, its teachers take part in a five-day training institute in the summer and two on-site professional development sessions provided by the program during the school year over a three-year period. Cost to the schools is based on location and size of the school. Other new schools that took part in training in June and July with Barling were Hamburg Middle School, Portland Elementary School, and Noble-Allbritton Elementary School, all in the Hamburg School District. 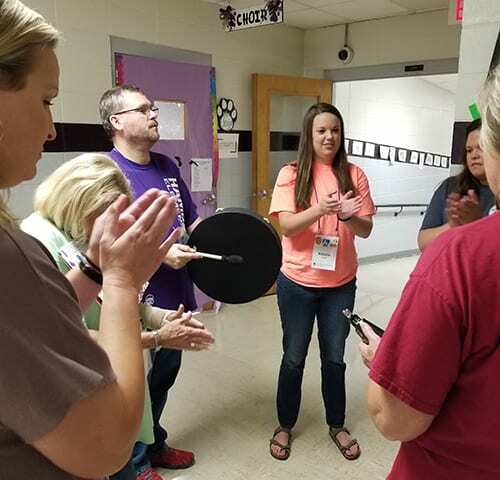 A+ staff also provide two-day training for three schools that are in their final year of training: Bobby G. Lester Elementary and Murrell Taylor Elementary in the Jacksonville North Pulaski School District and White County Central High School. Teachers and arts specialists from across the state who have been trained in what’s called the Eight Essentials train school personnel. The eight essentials – arts, curriculum, experiential learning, multiple learning pathways, enriched assessment, collaboration, infrastructure, and culture – are part of a whole-school design with an arts-integration component. Landrum, a former A+ school principal, works with the administrators of each school to outline leadership responsibilities. Cristy West, principal of Portland Elementary School, said she was thrilled when her school’s application was accepted. Fellows are teachers, teaching artists, and professors from across the state who conduct the training in arts integration and the other seven essentials, Landrum explained.